Dental implants are an ideal option for patients who want to regain the confidence lost by missing teeth. Implants are intended to look and feel just like real teeth so that you can talk, chew, laugh and brush and floss your teeth as you normally would. 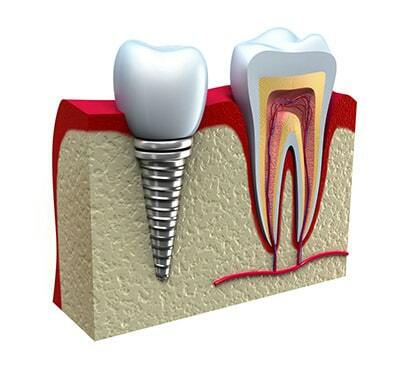 An implant is a titanium post inserted into the bone where your tooth would be. The implant heals over a course of a few months and fuses with the bone surrounding it. Once this has taken place, an impression can be made to fabricate a tooth or attachment that is fixed into the implant. Dental implants can be used to replace just one, many or all of your teeth. If you are only missing one tooth, only one implant and replacement tooth is needed. However, if you are missing several teeth, implants can be placed in strategic positions to support a bridge that is permanently placed. If you are missing all of your teeth, implants can be used to support a removable denture that can be snapped on or off of implants or a fixed denture that is permanently screwed on to implants.